Knorr Chicken Seasoning Powder - Hong Kong Recipe is made with quality real chicken meat that adds well-balanced chicken umami and aroma to all your dishes. Preferred by popular Hong Kong Chefs because it brings out the natural and authentic taste of Chinese dishes, it is perfect for use in stir-fry, soup and marinade. Salt, Maltodextrin, Monosodium Glutamate, Cornflour, Chicken Meat and Fat, Sugar, Permitted Flavouring (Contains Egg), Hydrolysed Vegetable Protein, Sodium Inosinate and Guanylate, Soy Sauce (Contains Wheat), Spices. All food additives used are from plant, animal and synthetic origins. May contain traces of cereals containing gluten, milk, fish, crustacean, mollusc, peanut and tree nuts. 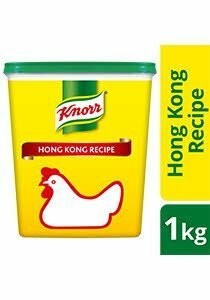 For Stock: Dissolve 20g of Knorr Hong Kong Recipe Chicken Seasoning Powder in 1L of boiling water or add the desired amount to your own stock to further boost the flavour. For Stir-Frying, Marinating, Steaming and Dim Sum: Sprinkle desired amount of Knorr Hong Kong Recipe Chicken Seasoning Powder to improve flavour and taste of foods, or during marination to enhance the flavour of Dim Sum.